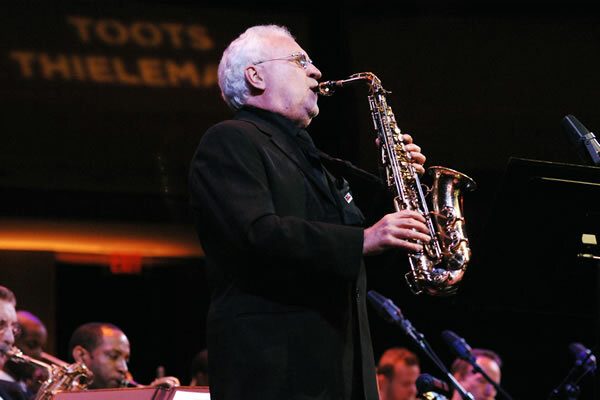 Alto Saxophonist Lee Konitz has enjoyed one of the most creative and prolific careers in modern jazz. While remaining on the cutting edge of improvisation, Konitz has had the opportunity to lead several groups that has included the “who’s who” of the jazz world. As a band leader, he has recorded dozens of albums over his storied career while also collaborating with famed jazz musicians on countless albums. The New York Times declares Konitz “is able to erase context and preconceptions, and more or less blow your mind.” Konitz was awarded the NEA Jazz Master Award in 2009, voted “Alto Saxophonist of the Year” by Downbeat Magazine’s “Critics Poll” in 2010, and will also be recognized with the Germany Jazz Price Award in 2013. At a young 85 years old, Konitz is still selling out concerts all around the world as he continues showcase his unique, rhythmic style. Sheila Jordan, an American singer and songwriter, has been a student of Jazz her whole life and has become one of the most respected musicians around. Jordan’s first great influence and mentor was Charlie Parker and, indeed, most of her influences have been instrumentalists rather than singers. Jazz Times describes Jordan as “a one-of-a-kind artist who possesses the power to captivate audiences, inviting all to join her on a magical mystery tour of jazz history.” In 2012, Jordan accepted the NEA Jazz Masters Award, which was given to her because of her lifelong commitment to Jazz and its teachings. Jordan has received several other honors, including the 2008 Mary Lou Williams Award for a Lifetime of Service to Jazz. In 2012, she released her latest album, Yesterdays, which blends imaginative music making and deeply felt, richly emotional story telling. Aaron Diehl is the 2011 Cole Porter Fellow in Jazz of the American Pianists Association. Hailed by The New York Times as a “Revelation,” and the Chicago Tribune as “The most promising discovery that [Wynton] Marsalis has made since Eric Reed,” Aaron Diehl’s distinctive interpretations of the music of Scott Joplin, Jelly Roll Morton, Art Tatum, Duke Ellington, and other masters pays homage to the tradition while establishing his own original voice. Diehl has performed with the Wynton Marsalis Septet, the Jazz at Lincoln Center Orchestra, The Boston Symphony Orchestra, Benny Golson, Hank Jones, Wycliffe Gordon, Victor Goines, Wessell Anderson, Loren Schoenberg, and has been featured on Marian McPartland’s NPR radio show Piano Jazz. His latest trio CD is entitled Live at the Players.